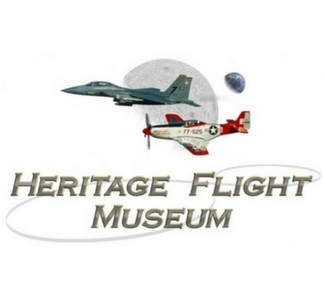 The Heritage Flight Museum (HFM) was founded by Apollo 8 astronaut William Anders in 1996. The purpose of the museum is to help educate the public on the many contributions made by U.S. military aircraft, the people that flew them, to national security and for freedom. There are over 16 exhibits from such aircraft as, a P51 Mustang "Val-Halla", a A-1 Skyraider "The Proud American", a T6-D Texan "Hog Wild Gunner" and a H-13 Grasshoper. Additionally, an interactive exhibit is in place to allow visitors to fly the museum aircraft via the Microsoft Flight Simulator located in the display hangar. Garry Smith (Newcastle, Australia), donated over $20,000 worth of billable time to create a version of the Bellingham Airport as it was during WW II when Bellingham Airport was a US Army Air Corps base. Garry also revised the flight sim aircraft models to match the HFM’s aircraft – so in addition to accurate scenery, they now have accurate aircraft as well. All of these attractions are sure to enhance any visitor's experience! Stay at Oxford Suites Bellingham!